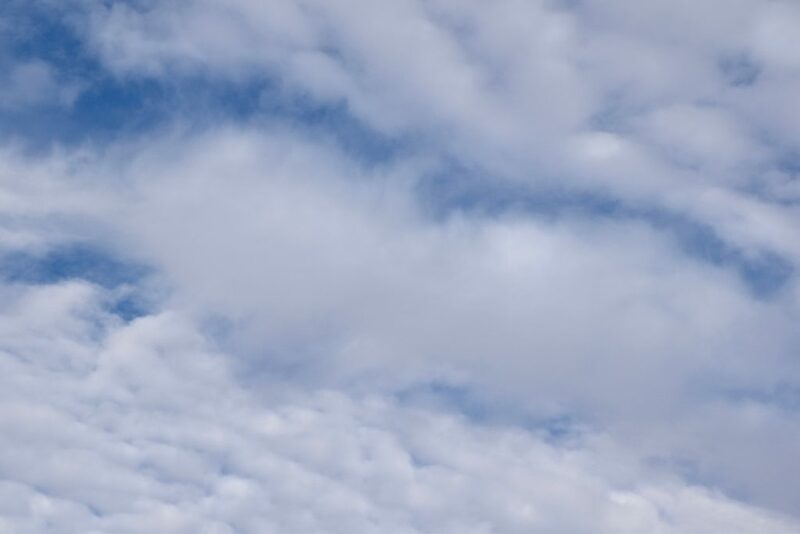 They seem to go together every time we have Altocumulus clouds; aircraft flying through them create holes or canals! Have been photographing this phenomenon since the early 1980s, and I have not seen it so consistently occur every time there was a flake of Altocumulus around as has been the case here this winter! Its likely because our Altocumulus clouds have mostly been so cold, having temperatures lower than -15° C. Mid-level Altocumulus clouds can range in temperature from well-above freezing to below -30° C.
The National Weather Service sounding launched from the U of AZ about 3:30 PM, near the time that the “high temperature” contrail was being produced. A slight amount of Altocumulus was over and downwind of the launch site. 3:37 PM. A four prop engine aircraft flies just below (maybe 100-300 feet is all) the base of the Altocumulus layer and left a LONG contrail. 3:37 PM. The long contrail behind that plane. Note that it goes into clear air; cloud droplets not required. Looks exactly like a normal contrail, those produced by jets at temperatures lower than -35°C when the air is moist. 3:44 PM. That contrail now extended from horizon to horizon. it appeared that he climbed through this layer on the way out. The broadening with visual evidence of ice is in the upper right hand corner. 4:16 PM. Now the classic ice canal is obvious in our Altocumulus layer. More aircraft produced ice is present as well. 4:16 PM. Zooming in on a segment of this canal shows that while its completely ice, there are no virga trails showing. Am guessing that those prop engines produced prodigious numbers of ice crystals via prop tip cooling to below -40°C, where homogenous nucleation of ice occurs (producing prodigious concentrations of ice crystals, maybe tens of thousands per liter in the immediate lee of the prop tip). Here the crystals have spread out due to turbulence, but there are just too many competeing for the available vapor to produce crystals big enough to have much of a fall speed. 5:12 PM. Due to the low windspeed at cloud level, just 15 knots or so, this ice canal was visible for more than an hour and a half. It was remarkable how close to natural Cirrus looked at that time. It would be almost impossible to assign this ice to the level of the Altocumulus. Check the close up, next. 5:12 PM. 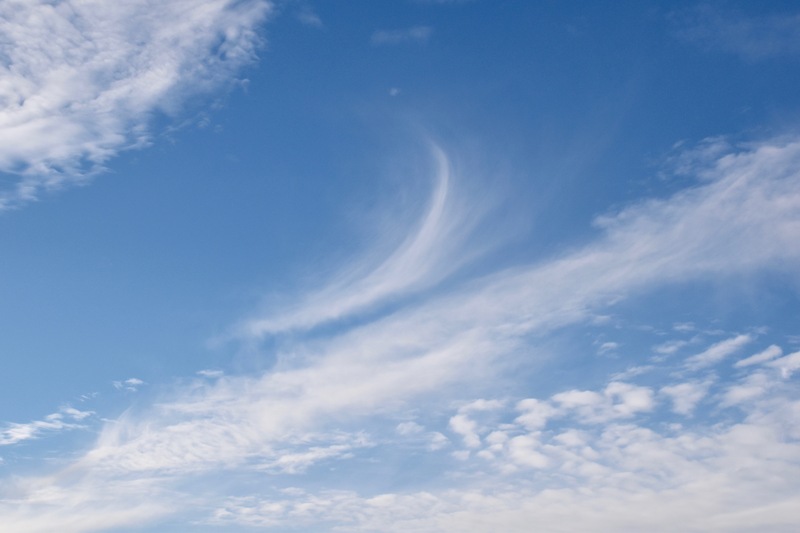 Cirrus uncinus homogenitus (I’m not kidding. that would be the name for this Cirrus, having been produced by man (well, or a woman pilot, of course). 5:13 PM. Unperturbed Altocumulus perlucidus translucidus (the latter, little or no shading due to thinness of elements). 5:14 PM. 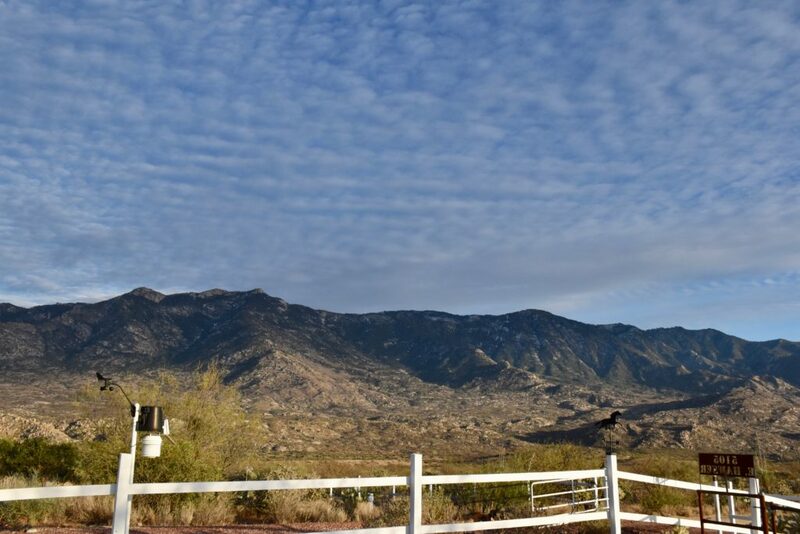 Shadow drama on the Catalina Mountains from those Altocumulus clouds, made even more interesting by the presence of a weather station in the photo. 5:58 PM. The setting sun illuminates that last bit of the aircraft-produced ice canal (“homoCirrus” on the right). This was probably the longest viewing time for any such event over one location, again due to the light winds up there. Not a single model run since two days ago has produced a big trough in the SW US, in complete opposition to the interpretation of spaghetti ensemble output at that time. This would be, IMO, one the greatest busts of all time (not for me, of course), but for spaghetti ensembles (I was only foretelling what they told me), spaghetti considered to be one of the great forecasting advances of all time when computers became powerful enough to produce them in a timely manner. If we believe these later model runs, it will be relatively hot and dry here, not cold and wet, as was suggested here. But being of a stubborn nature, Cloud Maven Person is not yo-yo-ing on his forecast just yet. Surprises are almost certain in these model runs, since spaghetti still supports troughing beyond 10-12 days… Standing by for model yo-yo-ing…. A laugher (???) below from our very latest computer run (from IPS Meteostar again). This map in incredible in the lack of jet stream activity over most of the US! This 500 millibar map is based on global data from 11 PM AST. last evening. Its valid for February 7th, 11 PM AST, way out there. This is a remarkably quiet map for wintertime in the US! Can it possibly be right? Hope not, at least in our area. 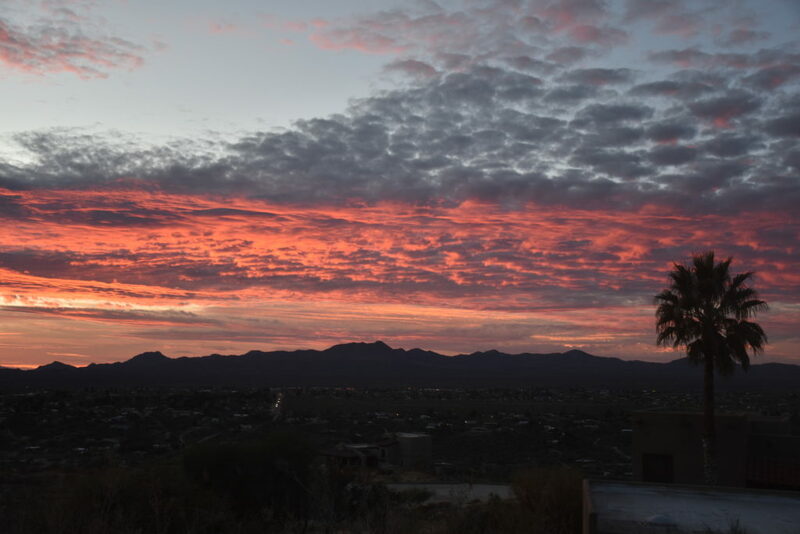 Sun and Altocumulus clouds combine to provide a colorful sunrise and a sunset on the same day! Rain on tap! “Rain on tap” does not refer to a microbrew, for those who’ve accidentally stumbled onto this site. 7:29 AM. Ice crystals trail down from this region of cloud cover toward the north. Was it hers or ours? This Altocu layer was at -15°C (about 4°F), cold enough for some natural ice, but not as prolific as this. 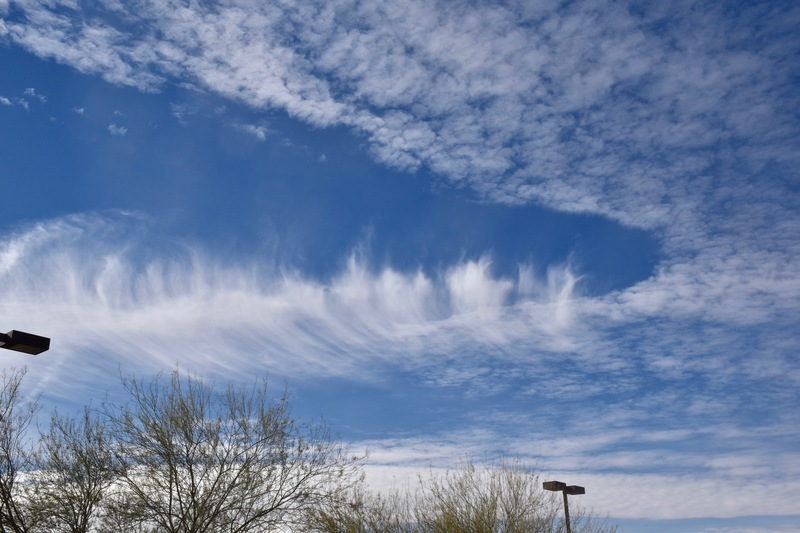 The fact that the ice does not trail downward much indicates the crystals in this virga were really small, also suggesting a non-natural event since an aircraft can produce thousands per liter of ice crystals, none of which can grow to very large sizes. Maybe ours? 9:20 AM. 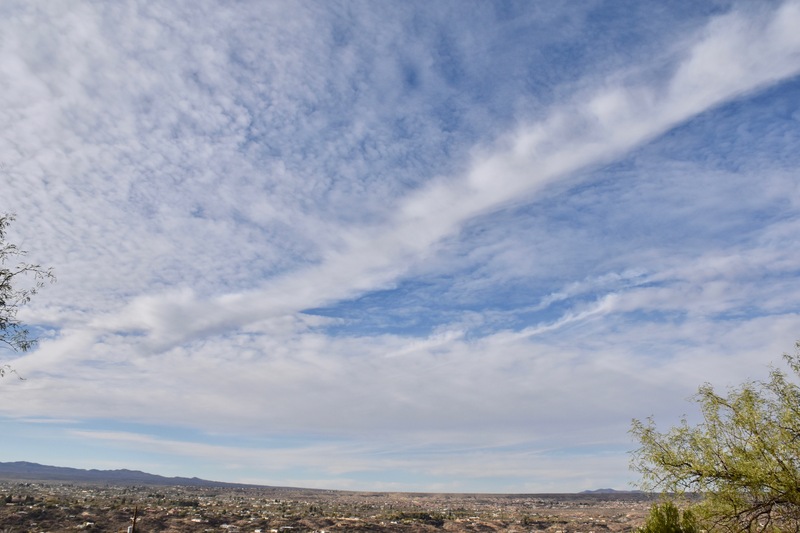 Well, what’s a day in Arizona with supercooled Altocumulus without an ice canal caused by an aircraft. So, they were occurring yesterday. We don’t see them much in the summer because the Altocumulus clouds are warmer. 4:36 PM. 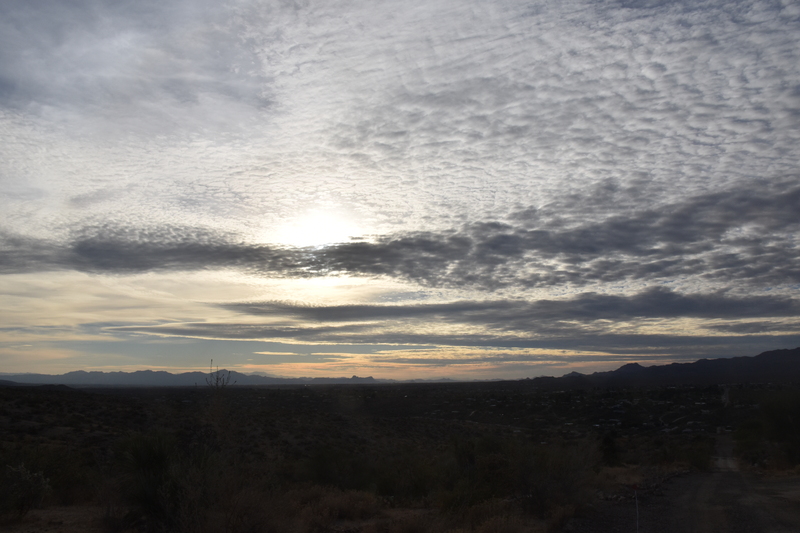 Our steady diet of Altocumulus yesterday is topped here by a veil of CIrrostratus, all leading one to expect a colorful sunset. 5:52 PM. So pretty again…. 5:52 PM. Wider view of the same scene. Rain on tap? Oh, yeah….finally. One forecaster friend is predicting 0.5 inches! How nice would that be? 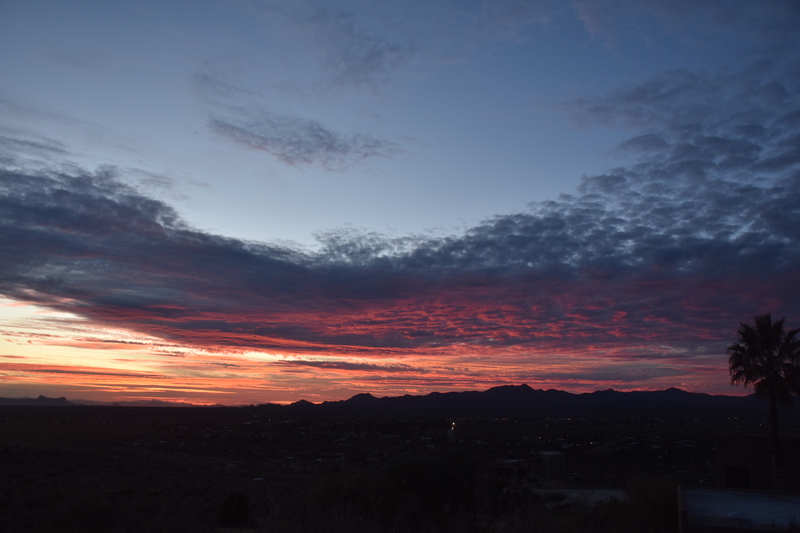 The rain will likely begin toward midnight–check it here from our nice U of AZ Weather Department. Looking for more rain in AZ after mid-month, toward the 20th. I use that expression not only to draw attention to myself since my name is Art, or, “Artie boy” to mom, but also because I had a role in bringing this phenomenon to the attention of the scientific community; that is, that an aircraft could glaciate portions of clouds at temperatures as high as -8°C. This in a peer-reviewed article so controversial it was rejected twice by journal reviewers before “getting in “(pdf here)! Some background on why this happened is found in a footer way down below…. Its common knowledge today that an aircraft can produce in essence a contrail in clouds at temperatures down to about -10°C and must be avoided when researchers are sampling the same cloud over and over at below freezing temperatures. 7:28 AM. 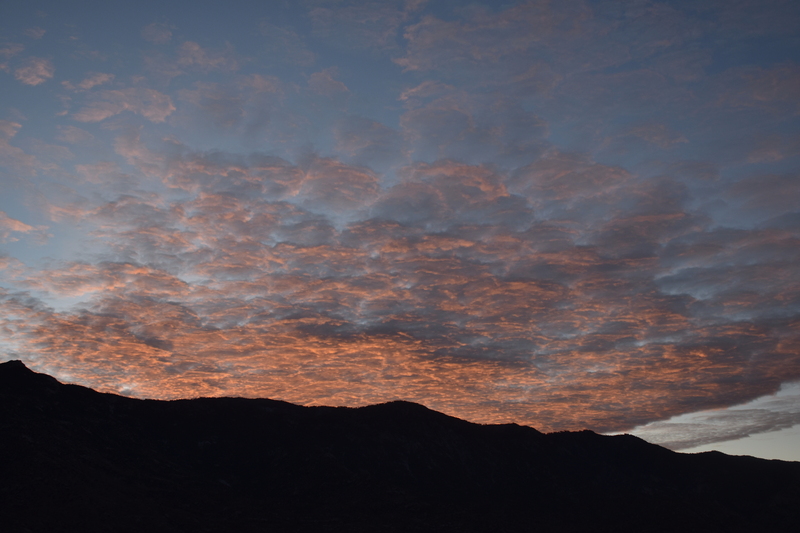 Really cold Altocumulus perlucidus lurks over the Catalinas. The sounding suggests that this layer was at -26̂°C, and yet no ice or virga is present. This is not unusual. Ice tends to form more readily when the droplets in clouds are larger–these were likely tiny, 10-15 microns in diameter, and, being a layer high in the atmosphere, not connected to the ground, meant there would be a dearth of ice-forming substances like dirt, well, kaolin mineral particles. 8:01 AM. 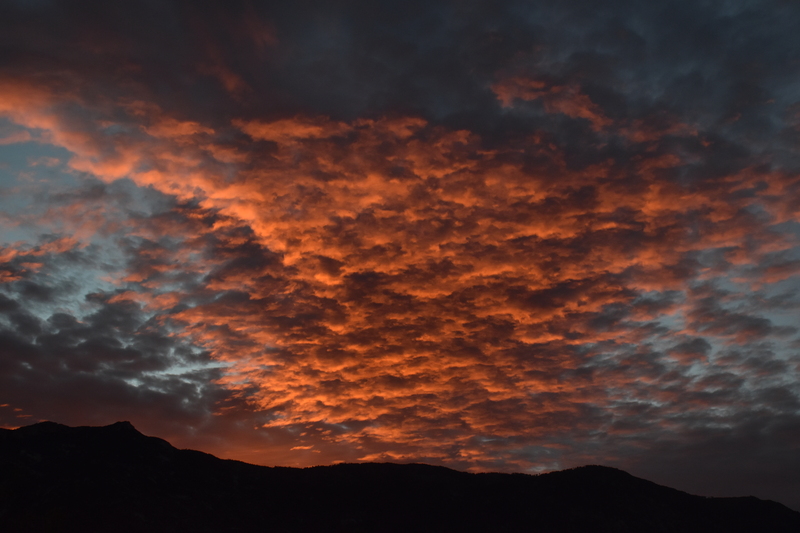 Well, OK, for the really sharp-eyed cloud maven juniors, yes there was a trace of ice here and there in those clouds. This sounding was launched about 3:30 AM AST yesterday morning. During the day, the bottom of the Altocumulus clouds lowered and got a little warmer, but still plenty cold for aircraft ice production. Then, as the Altocumulus layer filled in from the west, the aircraft effects roared to life. An example from yesterday, one that passed right overhead of little Catalina! 10:01 AM. A parch of aircraft-induced ice in this Altocumulus perlucidus translucidus composed of supercooled droplets otherwise, is about to pass overhead of Catalina. 10:08 AM. High temperature contrails rip through a Altocumulus perlucidud translucidus layer up around -25°C. 10:10 AM. Looking for some optical fireworks here, such as a tangential arc (halo curving the wrong way), but only a hint of one showed up. Can you see it? 11:23 AM. Another clearing with ice below it is seen just SW of Catalina from the parking lot of Basha’s where I went to get some cottage cheese. 11:33 AM. Sun dog (parhelia) lights up in the ice patch above after I came out of Basha’s with some cottage cheese. Note to writers; little, seemingly irrelevant details like what you bought in a supermarket makes your writing come alive for the reader. 1:21 PM. There’s another couple! They were just everywhere yesterday! 3:52 PM. Later as the moist layer deepened and lowered further, there was ice aplenty, but it was impossible IMO to tell whether it was au natural or aircraft-induced. Surely, some was due to aircraft penetrations of supercooled clouds. However, when the air is rising enough, a hole or ice canal may not appear since droplets can reform rapidly. 3:52 PM. Looking more to the west where the long trails of ice are more visible. 4:14 PM. I feel asserting here. I assert that this one is from an aircraft, but with droplet backfill that prevented a hole from forming. 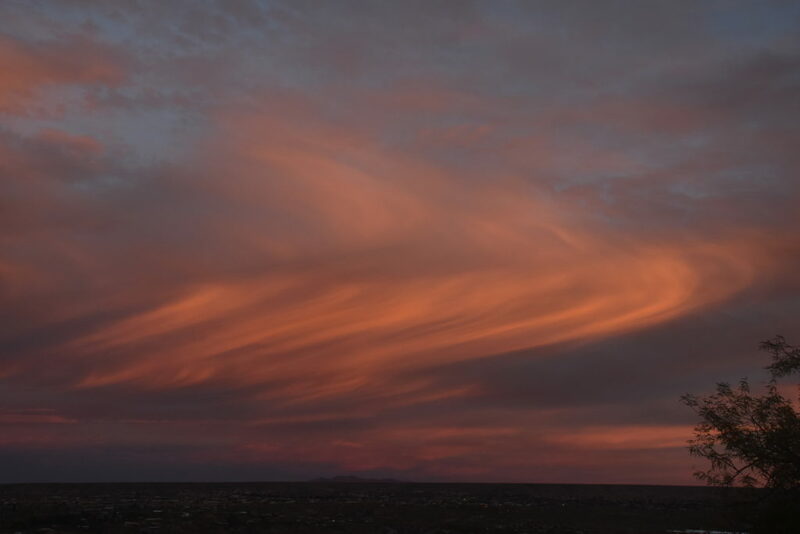 Looks like “phony” virga to me, and, of course, to you, too, as a certified member of the cloud maven society. 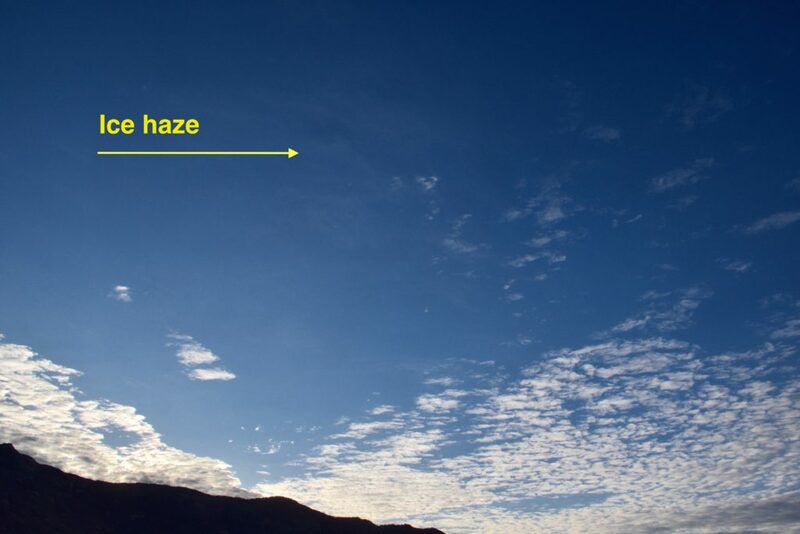 The U of AZ balloon sounding launched at 3:30 PM suggests the bases of the Altocu have dropped down to about 18,000 feet above sea level, 15,000 feet or so above Catalina, and are much warmer, and thicker than when the day started as we could see. More interesting middle and high clouds, probably a great sunset/sunrise or three, but no rain, just virga. The present mass of middle clouds passing over has some virga and sprinkles, but that’s about it from this episode. No real support yet for a change in our dry, warmer than normal weather regime in spaghetti plots though one trough a week or so out is forecast to bring a little rain. This phenomenon had been shot by photographers for decades, yep, DECADES, BUT, it was believed (apparently) by those doing cloud research, that it only happened at very low temperatures such as those when the normal contrails we see occur (at temperatures lower than -35°C), viz., it was ignored. Another factor was that all of the rare photos of this phenomenon, dubbed “Aircraft Produced Ice Particles” (APIPs, by yours truly, though not the greatest name) appeared in lay or quasi-lay publications and were likely missed by those with big Ph. Ds. who only read technical journals. An example of this was on the cover of the Bulletin of the American Meteorological Society in 1968, a cover shot which drew the greatest amount of reader comments that the journal had ever seen! They went on for a couple of months, some suggesting that the ice and hole in cloud was due to a meteorite! Also, it was a rare case indeed when the photographer could report the temperature at which it occurred. 5:38 PM. 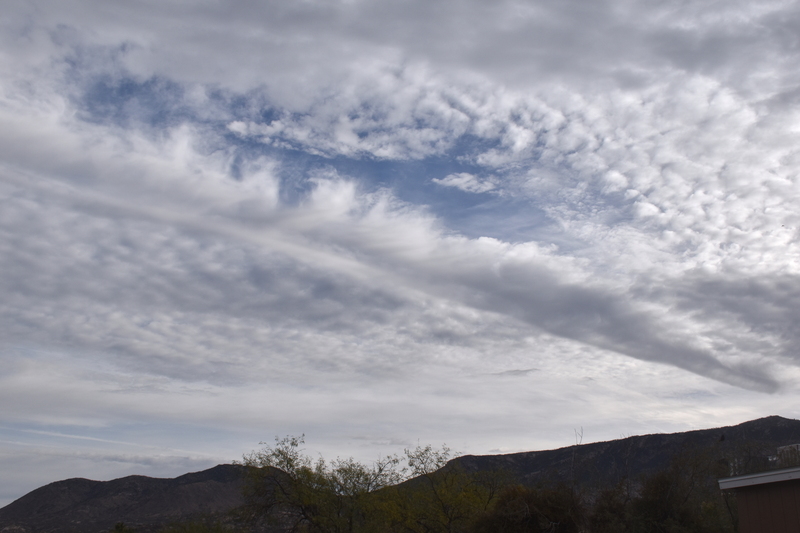 Altostratus with nearly straight lines of lower hanging virga in the distance. One cannot help but wonder if the passage of an aircraft enhanced the ice falling out and that’s why they are so linear. There were quite a few aircraft-induced lines of ice yesterday, but all developed in cold Altocumulus clouds. There’s one over there to the north…. 5:33 PM. Lppking over there to the N and you can see a rivulet of ice falling below that patch of Altocumulus. one of many yesterday, though this is the prettiest one. You can also see that there is something “wrong” here. The trails below appearing to be slanting toward the west and the flow was from the east. This indicates that the flow was stronger at lower elevations, an oddity. Brain’s been pretty empty lately, not much to say except “same old same old”, as here. But then some wild computer forecasts came out last evening that were worth mentioning in light of the fires that have plagued southern California. Because they suggest that a belt of tropical flow will break through under the gigantic ridge that has blocked storms from the entire West Coast over the past weeks. This from last night’s 5 PM GFS global model run, valid for 5 PM AST Christmas Day. What is shown is that the tropical input is about to combine with a trough over the Bay Area. When this happens both are energized. 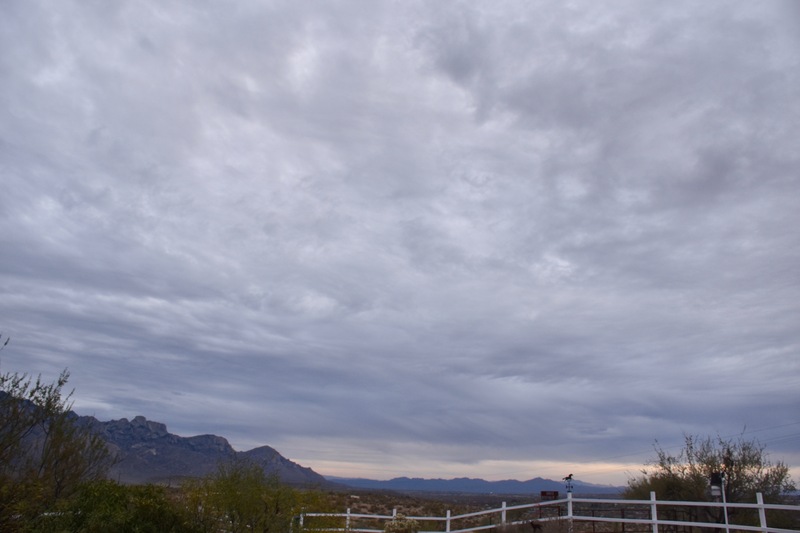 Rain is forecast to have fallen in southern Arizona before this point, however; our measly 0.01 inches so far here in Sutherland Heights so far in December will likely be added to along with a switch to uncomfortably cold weather. Of course, we look for support in these longer range forecasts by having some spaghetti–that is, take a look at what we call “spaghetti”, those crazy plots in which the model starting conditions are tweaked that bit to see how the model runs change. Here are some plots, also from last night’s model. As you can see in this first plot for the evening of December 22nd AST, the clustering of blue and red lines off the West Coast, that our blocking ridge (composed of a deep mass of warmer air) is extruding all the way almost to where Santa Claus lives, yes, that far to the north. In fact, so far that it will be unsustainable over that distance fromt the deep tropics to almost the North Pole. At this point, cold air is pouring down the east side of that ridge and into the Pac NW and eventually down toward us. Does that extremely cold air make it here? Not sure yet, but its something to watch out for before that ridge fractures and allows warmer, moist Pacific air to reach us. So much uncertainty, so much fun! I am really pumped up about all this uncertainty! Valid at 5 PM December 22nd. This is really strong support for a major trough in the SW, and likely rain in southern AZ, Sutherland Heights around this time. Below is the spaghetti dish for the “breakthrough” flow situation shown in the prog output valid for Christmas Day with some annotation on it. Looking at the above, I think we can count on a breakthrough flow pattern from the Pac. Where it barges into the West Coast will be subject to question over the next week or so. That really can’t be determined right now. I am sure those in southern Cal hope, if there is a breakthrough from the Pac, it comes in farther north than shown in the model run here today! Patterns like the one shown in that run can routinely produce 10 inches in a day once they get going should something burst through at low latitudes. 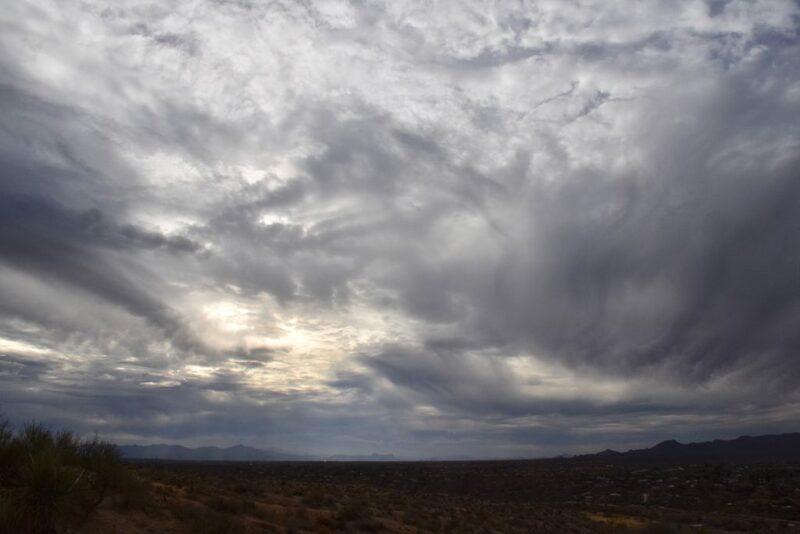 The brighter side would be that the chances of a significant rain here droughty southern AZ would at last increase. I hope you had a chance to venture out late yesterday morning and see some of the most spectacular Cirrus (uncinus) displays with HUGE streamers that you will ever see. 7:46 AM. 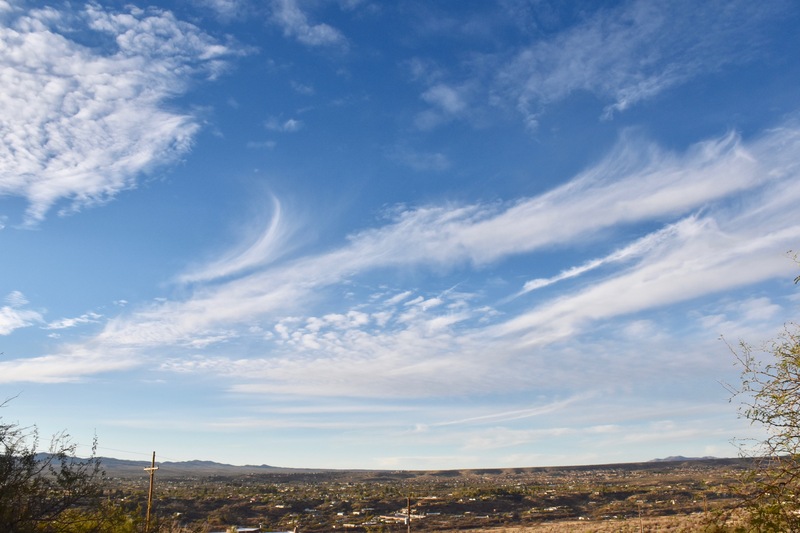 A complex sky with Altocumulus on the right and various species of Cirrus such as Cirrus spissatus, center. 10:58 AM. From the Rillito Bridge at Swan, this amazing scene with Cirrus uncinus and those gigantically long tails of ice! 11:08 AM. Mimics trees in a way, both reaching upward. 11:12 AM. From the Rillito Bridge at Swan again. Kind of running around like a chicken with its hat off! The heads of the Ci unc are overhead. 11:14 AM. One final shot. There was an interesting contrail distraction later that day. Are these “castellanus” crenelations, or is it perspective? Those knobs are usually pointed downward due to the action of the wingtip vortices that take them downward behind the plane. Maybe they’re just sloped down at us, not puffed up. Well, there is still a chance of some rain late in the month, late or after the TG holiday weekend….. FIngers crossed. Poor wildflower seeds. Aircraft inadvertent cloud seeding for Julie Mc. Also at 6:44 AM. From a smartphone, color not so great, though not bad either. U of AZ Wildcats balloon sounding, launched at about 3:30 AM yesterday. Those Altcumulus clouds were way up there for Altocu, 22,000 feet above Catalina, 25,000 feet above sea level.because they were so high, were so cold, AND were composed of supercooled liquid water, they ripe for aircraft to create ice going through them, likely on climb out and descent from TUS and perhaps PHX as well, Davis-Monthan. What was unusual, was that it was happening most all day as the clouds filled in some. They remained liquid, high, and cold. 7:23 AM. Wasn’t long before aircraft made their presence known in this cold, cold layer. 6:54 AM. I should point out that a colder topped Altostratus layer was present to the N. Its not represented well in the TUS sounding. That layer was all or mostly all ice (the rosy colored segment of this photo). 7:37 AM. An unperturbed view of Altocumulus perlucidus (“Mackerel sky”). Are there any mackerel left? Also, from a cloud viewing standpoint, these are much higher than one would guess. The fact that aircraft were making ice in them is a clue that they were higher than we would normally think of a “middle-level” cloud. I like patterns like this. I thought you would like to know that about me. 9:03 AM. Slicing and dicing. An aircraft has left a contrail through a Altocumulus line . What’s really unusual here is the ice contrail so far outside the liquid water cloud. It is thought that hole-punch and ice canals are limited to regions where there are liquid droplets, and so this is quite an anomaly, one that suggests the humidity was almost 100% with respect to water outside the cloud boundaries. 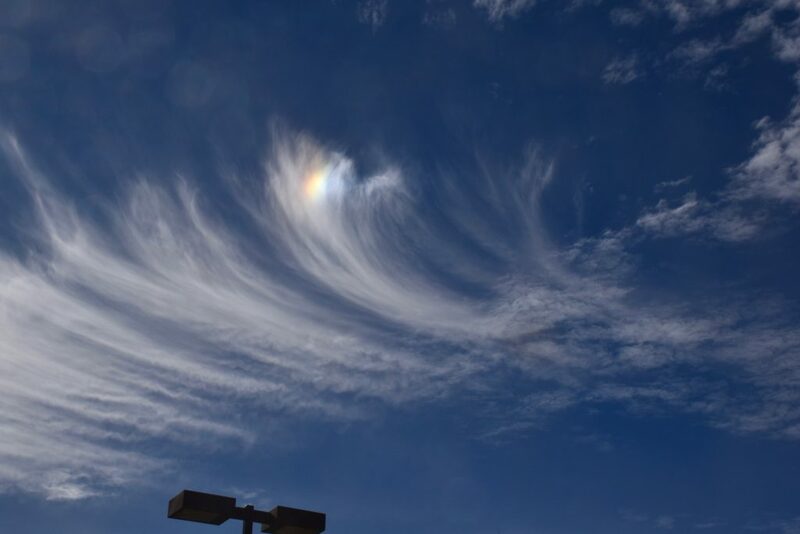 Also, can you just make out the partial 22° halo, indicating very simple ice crystals like columns and plates? Streamers of tiny ice crystals are also evident, trailing to the right, below the contrail? This shows that the wind decreased rapidly with height just below the flight level, but was still from the southwest to west. 9:24 AM. Coming at you, another ice-canal has formed SW-W of Catalina, a favored locale for the formation of these canals on days like this. 9:40 AM. 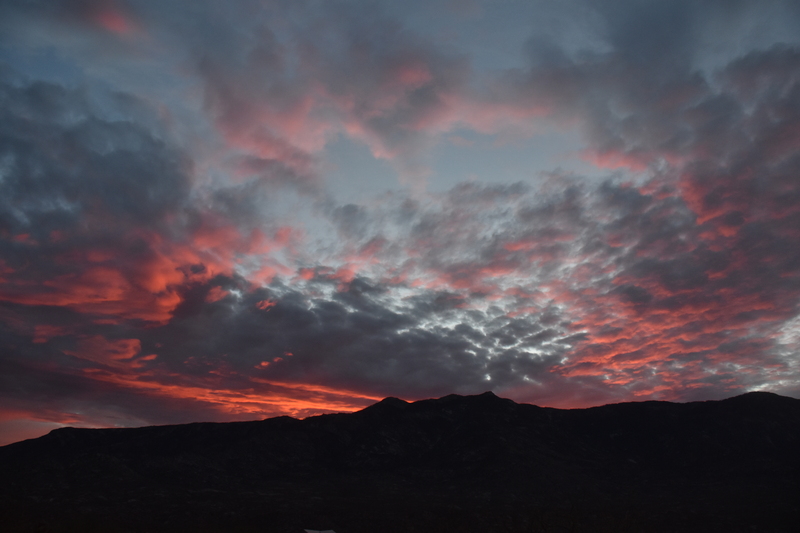 What’s left of it is almost to Catalina. Note streamers of ice. Below, a close up of a couple. 9:40 AM. The intensity and narrowness of these streamers point to an artificial origin. So, even if you didn’t see the canal, and here, some of the clouds are reforming at the top of the streamer, you would make a good guess that this was not natural ice. Sometimes the canals can fill back in if the air is in overall ascent at cloud level. 9:57 AM. Here’s what those contrails in Altocumulus look like as they first appear. Can you spot’em? There are two. 1:45 PM. Another aircraft-produced ice event as the Altocumulus increased and became thicker, making detection of these events less obvious. Sometimes a canal clearing is very muted. 4:12 PM. Aircraft-induced hole punch cloud with ice below the hole. Can you spot it? See close up below. 4:12 PM. Close-up of that hole punch, ice mostly below the Altocumulus layer. 4:35 PM. That hole punch cloud 35 min later. 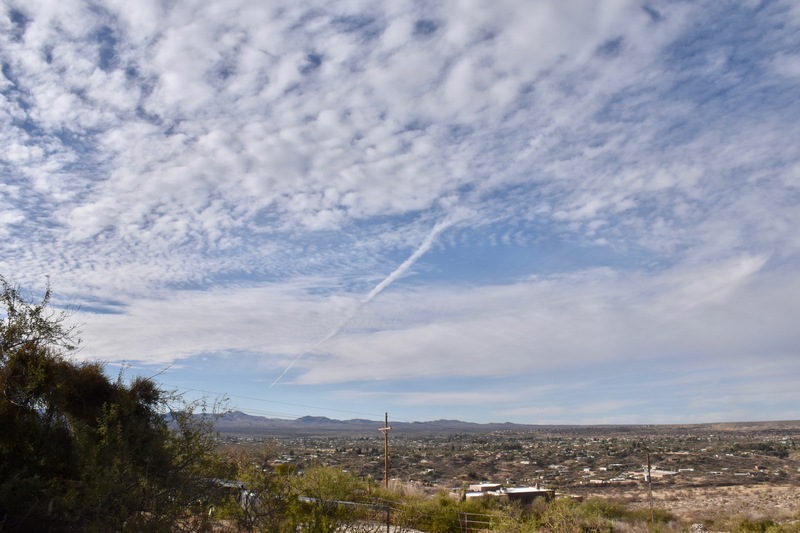 The long trail indicates high humidity well below the Altocumulus layer in which it appeared. The 3:30 PM balloon sounding from the U of AZ. A study in ambiguity. The day ended with an unusually bright sun dawg, mock sun, or parhelia. So bright it did, again, suggest a plume of ice from a prior aircraft passage through extra cold Altocu or Cirrocu clouds. But, just wild speculation here. Hope you don’t mind. 5:41 PM. Nice sunset, but one strongly impacted by clearing from aircraft-produced holes and lines of ice, the ice now mostly gone. Note to me and the two other people that drop by my cloud or “clod” blogulations: The embedded pop-up ads are due to a WP third party plug-in that needs to be repaired. It will likely happen today. Oddly, those pop-ups and blue highlighting and double underlining do not seem to be present outside of my personal view of my own blog, this according to hoster, “godaddy.” Even using a different browser other than FIrefox does not show them as I have just verified. Valid at 5 PM, May 2nd. Nice! I thought you’d be pretty happy when you saw this, as I was. BTW, there is a new International Cloud Atlas out there. Its possible there is a photo from Catalina, Arizona! I have not checked yet. Its just been published by the World Meteorological Organization of the United Nations. Still needs a little work, but overall is VERY, very nice. Came out out on March 23rd, so we’re a little behind here as usual. The thing that makes it different from prior and sometimes flawed atlases is that each photo is accompanied by some weather data and in many cases maps, radar or satellite imagery at the time of the photo. Some new expressions to toss around to your fellow cloud-centric folk are things like “Cirrus anthrogenitus”–Cirrus evolved from contrails and “Cumulus flammogenitus”, a Cumulus formed at the top of a fire, something we used to call, “pyrocumulus”, an unofficial term that somehow seems preferable to “flammo”. Ice canals amid Altocumulus are also fairly common. Ironically, a hole punch cloud with ice in the center, and an ice canal in an Altocumulus cloud layer can be readily seen on the new International Cloud Atlas submission site, now closed. They’ve mistakenly, IMO, referred to “ice canal” photos as “distrails” without mentioning the ice canal “cirrus” down the middle. 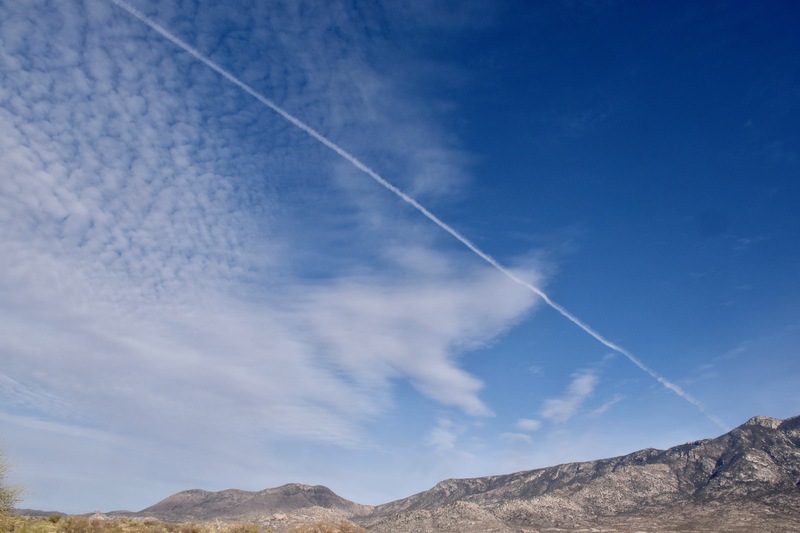 Formerly, distrails were clearings produced by aircraft in thin clouds without any change of phase in the cloud induced by the aircraft, unlike those holes and clearings produced when the ice-phase is triggered by an aircraft passage. 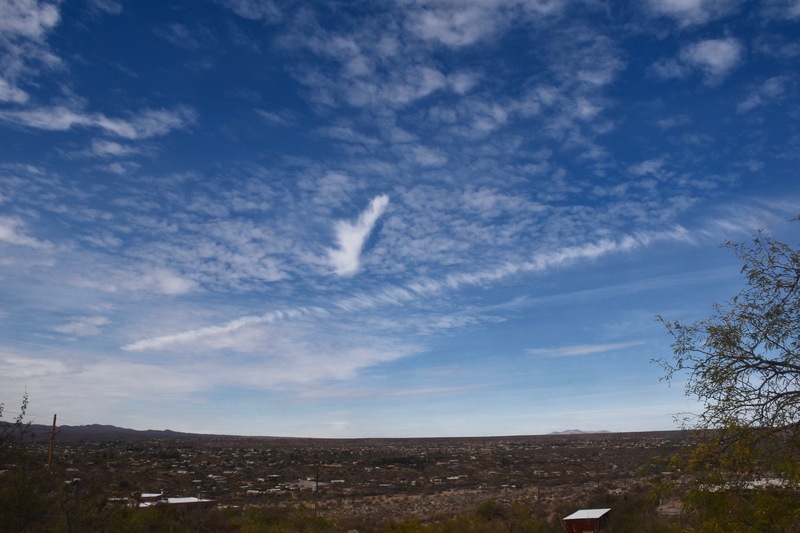 Certainly a “hole punch” cloud is not a distrail, a linear feature, and should have a separate nomenclature. 11:27 AM, January 2nd. The ice canal in the middle of an Altocumulus layer that might in the future be termed a Cirrus altocumuloanthroglaciogenitus. 7:04 PM. Seems like sunsets are occurring later and later. 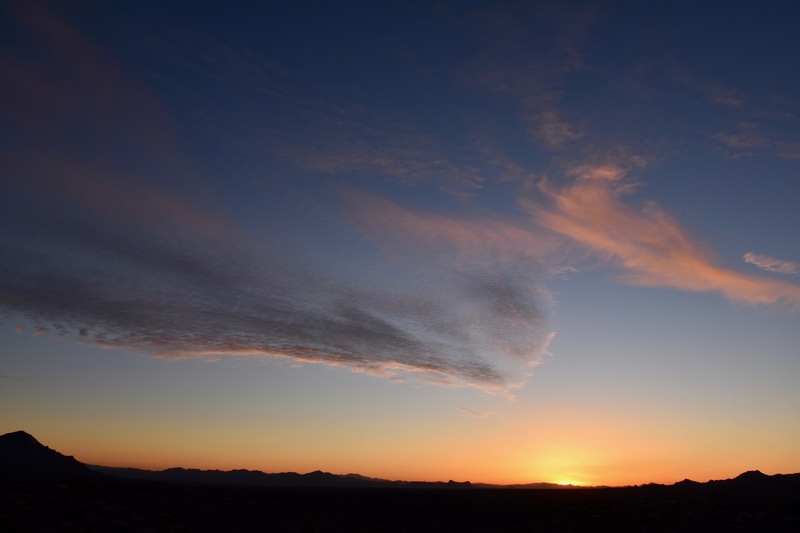 Here the setting sun allows some of the “topography” of Cirrus clouds to be accentuated. 1It should be pointed out immediately if not sooner that Catalina’s Cloud Maven Person had plenty of time to rectify, or suggest changes to the Atlas as he could have been part of this process, but didn’t really do anything except submit some images for consideration. More patterns galore, but with natural holes in them that made for an extra fascinating day! The Banner NWS TUS balloon sounding launched at around 3:30 PM from the Banner University of Arizona. 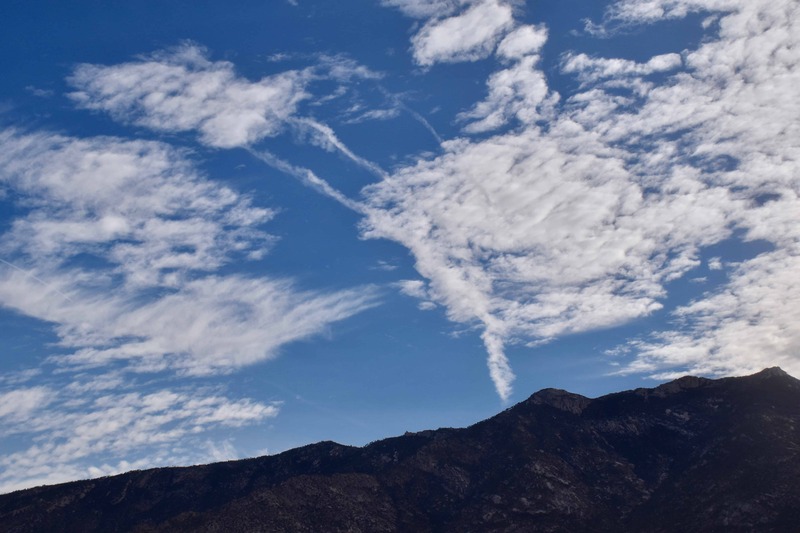 The temperature of the Cirrocumulus was indicated to be about -36° C, at about 26,000 feet above Catalina (29,000 feet ASL) and yet portions of the Cc had liquid droplets. 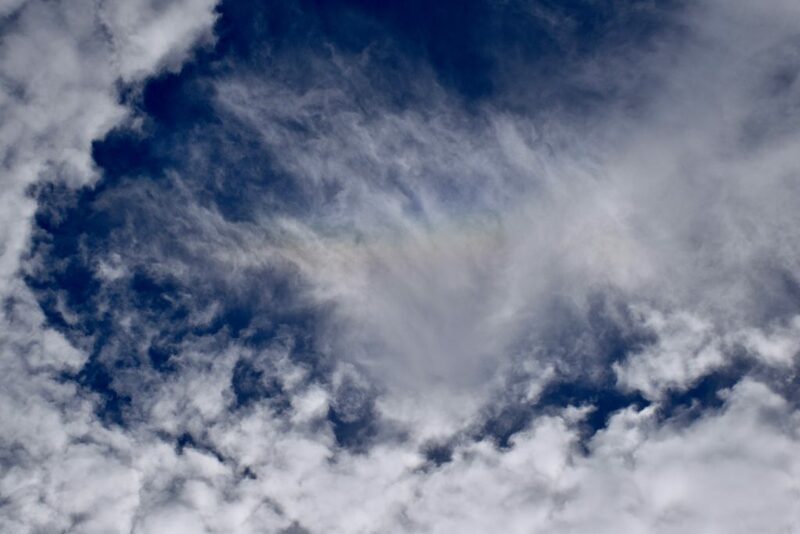 The higher vellums of Cirrostratus or Cirrus were located. And look closely at the fine patterns, lines and granulations in these shots! Truly mesmerizing. 4:21 PM. An outstanding example of no iridescence, maybe one of the best ever taken! The power pole shows signs of being in an archaic neighborhood. 4:23 PM. 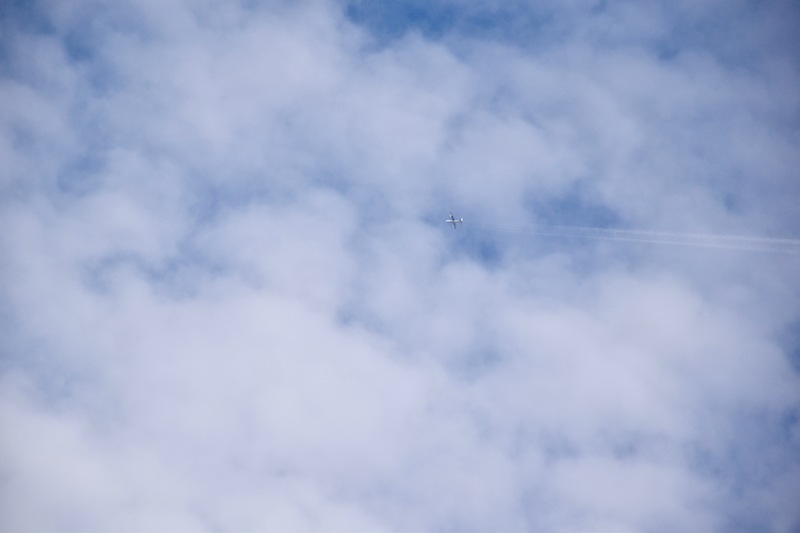 A commercial jet streams into it seems, the Altocumulus layer. Or did it? CMP thought so. 4:23 PM. Looks to have descended to below this layer. Note sun glint on aircraft. 4:23 PM. Zoomin’ some more. 4:26 PM. But, as the location of the aircraft path slipped downwind rapidly, there was NOTHING! I could not believe it! No ice canal with a clearing around it, and no contrail inside these clouds. The clearing would have occurred had the aircraft penetrated supercooled droplets leaving an ice canal. But, if the cloud was all ice, a penetration by an aircraft should have left a contrail, as they do in cirriform clouds. The conclusion? As close to this layer as the aircraft was, it did NOT apparently go into it. Amazing to this eye. 4:25 PM. Looking downwind at those “Altocumulo-cirrus” clouds, all ice from almost the very leading, upwind edge due to that -36°C temperature they were at. Though overhead, as you saw in the photos below, they might be reckoned as plain Altocumulus, and not solely composed of ice ones. By the way, if you caught it, there were a couple of standard, aircraft-produced, “hole punch” clouds at the very upwind, formative portion of this patch of clouds before it got here. These photos pretty much prove that the Cc at the formative end at that time was composed of highly supercooled droplets and that the passage of an aircraft produced ice, that caused a fall out hole. 1:52 PM. Hole punches caused by aircraft in the Cirrocumulus to Cirrus patch that moved over us later. 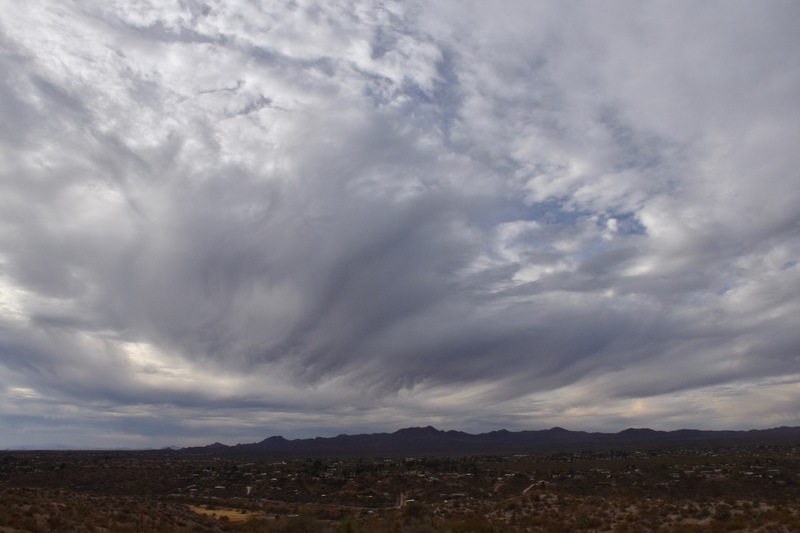 Clouds like these do not move at the speed of the wind, about 60mph up there yesterday at this level, but rather, the air moves through it a hump in the airflow that moves much more slowly than the wind. Note the slight iridescence in the hole on the right. Once again we had a brief period of optical fireworks, as a rare “circumzenithal arc” developed overhead of Catalina in some Cirrus strands. Hope you saw it and bragged about it to your less observant friends. After saying that, follow it up in a moment of feigned reflection, speaking to no one in particular, with a comment about “how sad it is when people don’t notice the beauty in the world around them.” Your friend will appreciate what a sensitive person you are. That would be great! 9:28:31 AM. First highlight begins, center, leading edge. 9:28:44 AM. Here we go! 9:29:43 AM. Starting to really light up! 9:29:45 AM. Zooming in…. Of course, like a rainbow, you would have to be exactly where I was to see this exact same sight, but I was alone and therefore, the only person in the world to see this. 9:30:29 AM. Last little wisp of color goes over. Whew, that was pretty much the climax of this event. Began to relax. calm down, as the possibility of seeing more “arcs”, began to fade. No more Cirrus was upwind. Most of these I have seen have been due to aircraft-produced ice particles (“APIPs”, as named by Rangno and Hobbs way back in 1983, J. Appl. Meteor. ), i. e., contrail like events produced by aircraft that occur at much higher than expected temperatures in “supercooled” clouds. No Altocumulus clouds were around this line of Cirrus uncinus clouds at the time this passed over, though there were plenty around, however. Likely this was produced upwind by an aircraft in Ac clouds, and the Altocumulus droplet clouds just evaporated. These aircraft produced ice clouds start out having prodigious, unnaturally high concentrations of ice, thousands per liter, and that in itself would lead, due to the competition of vapor among them, to tiny, pristine ice crystals like solid columns that would refract the sun’s light. 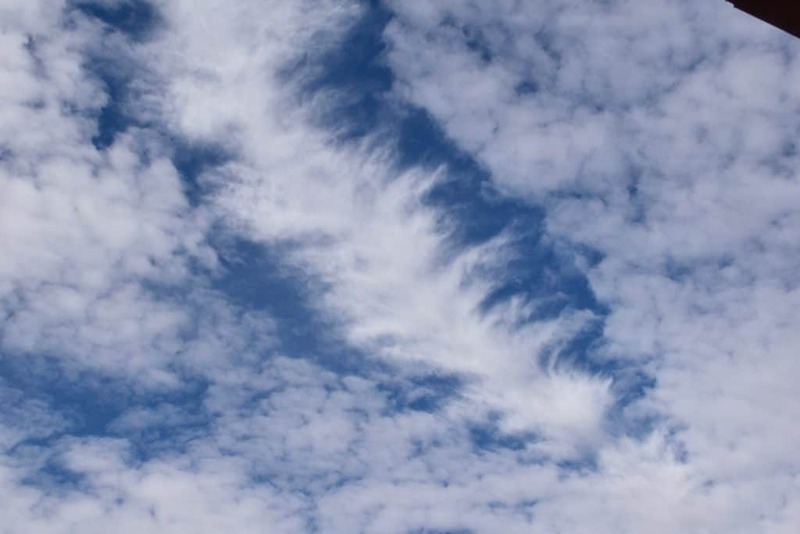 So, that’s my thought on the origin of this line of Cirrus uncinus, the line itself raising suspicions about its origin. It extended much farther than shown in these photos, and was intermittent, likely reflecting where the Altocu was, and where there were holes in the coverage. 11:03 AM. Iridescence, about as good as it gets. 11:07 AM. More iridescence. Hope you saw this, too. 11:08 AM. Intrusions of dry air started punching holes in clouds all over. 11:09 AM. Holes started to appear in adjacent clouds. 11:09 AM. Zooming in at this strange phenomenon. 11:11 AM. Geeminy Christmas, the sky is falling! 11:12 AM. Closer to life size here. Pretty remarkable. Outside border of hole seemed to have collapsing cloud filaments supporting a localized downdraft punch. 11:12: More holes began to appear next to the main one. 11:14 AM. More hole craziness! 11:15 AM. Wow. Look at the complexity in that hole. 11:17 AM. This lenticular had an exceptionally smooth top, but a hole started to develop underneath and a little downwind. 11:17 AM. Another dry air hole punch appeared. What an interesting day this has been so far, and its not even noon! Well, as you could imagine, I could go on and on about this, with many more photos, but need to quit here. And besides, it pretty much cleared off in the afternoon, and the hole phenomenon ended. What happened? 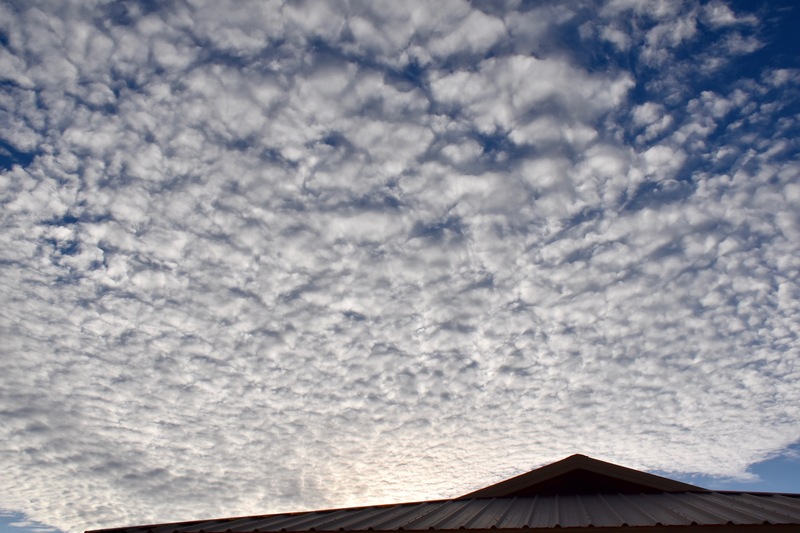 How cold were these Altocumulus clouds? (Answers printed upside down below). There were more, off in the distance, too. 11:29 AM. As it went over the horizon to the east. You can really see how strange it made the sky look. Note, too, the contrail from a much higher flying aircraft (at Cirrus levels). 4:02 PM. Those fine trails of virga (center of photo, trailing in strands to the right), were “probably” created by an aircraft. They don’t look natural to me, though when this happens without producing a ice canal or a clearing, its much more difficult to be certain. Those trails look too flat, a result of likely very high concentrations of ice crystals, all of which remain small due to the competition for the vapor in that cloud, and would be too small to collide with cloud droplets. There would be no hole or canal because the rise rate of the layer is producing droplet cloud faster than the ice crystals could take it away. In the prior photos with the ice canal, which did not fill in, you can guess the rise rate of the layer that produced the Ac per was nil. Those clouds did not fill in as the ice settled downward and out of the layer. Whew, lotta typing just then. 5:23 PM. Numerous holes were being punched in that cold Altocumulus layer out to the southwest of us. If you are pretty observant, you know that there is an airway out there, often filled with contrails. These, though are likely produced by those aircraft below the normal Cirrus levels, but rather would be ones departing or landing, in descent or climb modes, maybe from TUS? 5:41 PM. 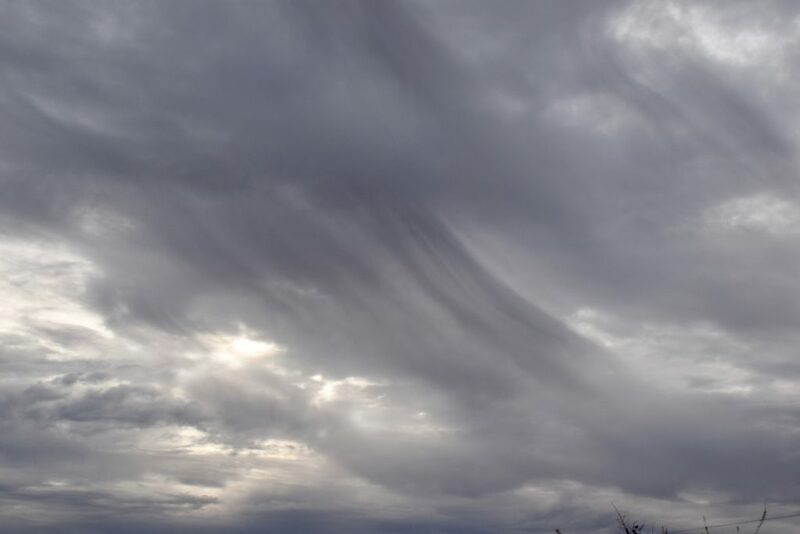 Zooming; pretty virga, but not natural. Now, we’re really quitting because I have other things to do, ones that have to be done, like discovering why our attic has so many rodents in it? Well, one, every so often, dammitall. Why is life one problem after another? The pre-dawn TUS sounding, PRESUMMED representative of that Ac per layer. It would have been where the two lines pinch together, and if somehow you can read the temperature, its between -25° and -30° C.
For the evening aircraft effects, there are two choices of layers. Probably was the lower, warmer one IMO. It was probably created by a jet, though the rarer prop aircraft can’t be ruled out. Seems to be associated with cooling around prop tips or some say over the wing cooling momentarily below around -40° C, though visually I would offer that its from the water-loaded exhaust, at least in jets, rather than air cooled as it goes over the wing.